In the early 1960s, the revolutionary Moulton bicycles were very popular in Britain. 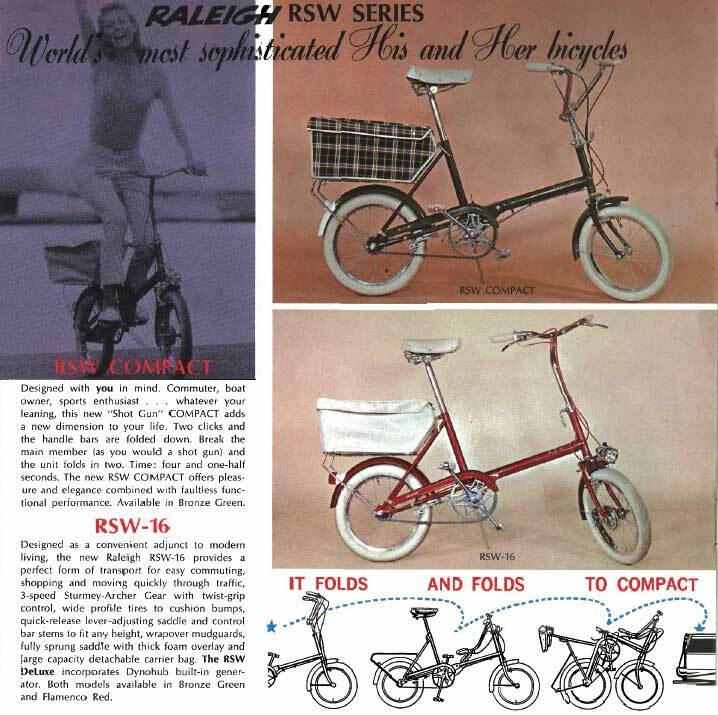 Raleigh's initial riposte was the RSW (Raleigh Small Wheel) series. Like the Moultons, the RSWs used 16 inch wheels, but unlike the Moultons, they lacked front and rear suspension. To make up for this lack, the RSW was supplied with very wide (2 inch!) tires designed to run at low pressures. The result was a much slower, harder-to-pedal bike compared with the Moulton. There were two basic variants of the RSW, the RSW and the RSW Compact. The Compact model folded up in the vertical plane, making it somewhat easier to store.